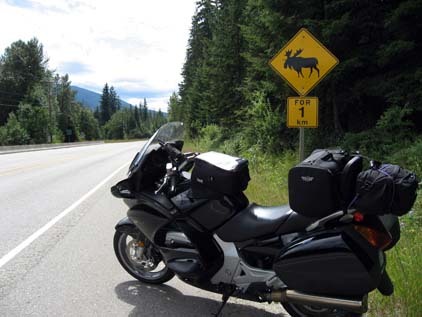 I bought a 2006 Honda ST1300 (click here for pictures and description), and I decided to go up to Canada and the Northern United States to explore and take a Canadian Motorcycle Trip on some great Canadian motorcycle roads and visit some relatives in areas I had never been. I left on Saturday, July 8th, 2006. I got home on Wednesday, August 2nd, 2006 after 26 days on the road. The motorcycle odometer says I went 10,468 miles. See the map below of where I went. On 8/1/06, Wednesday - BACK HOME! I drove home today from Tonopah, Nevada through Yosemite park. Click index_07_31_thru_08_02 for pictures. On 8/1/06, Tuesday, I left Laramie, Wyoming and drove my motorcycle west to Tonopah, Nevada. Click index_07_31_thru_08_02 for pictures. On 7/31/06, Monday, I left Sioux City, Iowa and drove my motorcycle west to Laramie, Wyoming. I passed through the South Dakota Badlands (Mount Rushmore and Sturgis Motorcycle Rally) on the way. Click index_07_31_thru_08_02 for pictures. On 7/30/06, Sunday, I left Chicago, Illinois and drove my motorcycle west to Sioux City, Iowa. I took US Highway 20 most of the way. Click index_07_27_thru_07_30 for pictures. On 7/28/06, Friday, I left Columbus, Indiana and drove my motorcycle north to Chicago, Illinois to visit my cousin Chip and family. Click index_07_27_thru_07_30 for pictures. On 7/27/06, Thursday, I left Detroit, Michigan and drove my motorcycle south to Columbus, Indiana to visit Brian Beach, wife Sharon, and family. Click index_07_27_thru_07_30 for pictures. On 7/25/06, Tuesday, I left Montreal, Quebec, Canada and drove first to the Canadian side of Niagara Falls, then down into the USA to Detroit Michigan to visit Ari Echt (my brother's wife's brother). Click index_07_22_thru_07_26 for pictures. On 7/24/06, Monday, I left Mont-Laurier, Quebec, Canada and took the short 2 hour drive to Montreal. Click index_07_22_thru_07_26 for pictures. 7/23/06 - Sunday - Left Marathon, Ontario, Canadadrove my Honda ST1300 motorcycle east along the top of Lake Superior to Wawa. From Wawa I took highway 101 east through Chapleau and Timmons, then east on Highway 66 to cross onto Quebec, Canada. I stayed in Mont-Laurier, Quebec, Canada. Click index_07_22_thru_07_26 for pictures. On 7/23/06, Sunday, I left Marathon, Ontario, Canada, and drove my Honda ST1300 motorcycle east along the top of Lake Superior to Wawa. From Wawa I took highway 101 east through Chapleau and Timmons, then east on Highway 66 to cross onto Quebec, Canada. I stayed in Mont-Laurier, Quebec, Canada. 7/22/06 - Saturday - Left Winnipeg, Alberta, Canada, drove the motorcycle east on Canada Highway 1 through Kenora where the scenery and drive got interesting again, then southeast down to Thunder Bay, Ontario, Canada which is on Lake Superior (the left most Great Lake), then I drove east around the top of Lake Superior to stay the night in Marathon, Ontario, Canada. Click index_07_22_thru_07_26 for pictures. 7/21/06 - Friday - Left Flaxville, Montana, drove the motorcycle to North Dakota, then north up into Canada and east over to Winnipeg, Manitoba, Canada. Boring drive, just moving east. Click index_07_18_thru_07_21 for pictures. 7/20/06 - Thursday - Left Medicine Hat, Canada, drove the motorcycle through Moose Jaw, Saskatchewan, Canada, then directly south across the USA/Canada border down into Flaxville, Montana to visit my cousin Karin Linder and her family. Click index_07_18_thru_07_21 for pictures. 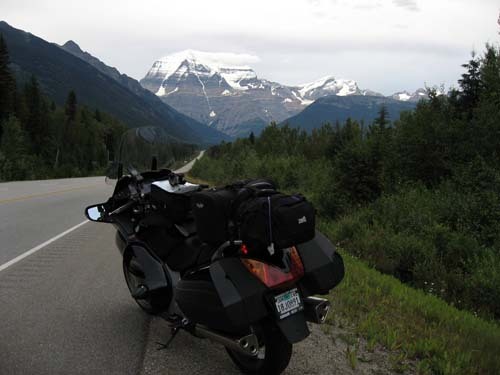 7/19/06 - Wednesday - Left Calgary, drove the motorcycle back through Jasper Canadian National Park on a slightly different route to loop to the south through Radium Hot Springs then finally ended up at Medicine Hat, Alberta, Canada. Click index_07_18_thru_07_21 for pictures. 7/17/06 - Monday - Left Jasper, drove the motorcycle south through Jasper Canadian National Park on the "Icefields Parkway" to Lake Louise, Canada then on through to Calgary, Canada (click here for a map of route). Click index_07_14_thru_07_17 for pictures. 7/16/06 - Sunday - Left Kamloops, drove the motorcycle first south to Hope, then north to Canada Highway 12 through Lillooet and up to 100 Mile House" then East to Jasper (click here for a map of route) ending up in Jasper, Canada. Click index_07_14_thru_07_17 for pictures. 7/15/06 - Saturday - Left Kelowna, drove a loop (click here for a map of loop) ending up in Kamloops, Canada. Click index_07_14_thru_07_17 for pictures. 7/14/06 - Friday - Left Tonasket, drove up to Kelowna, Canada on my motorcycle. Click index_07_14_thru_07_17 for pictures. 7/13/06 - Thursday - Left Clarkston, drove to Tonasket, Washington to visit cousin Doug. Click index_07_11_thru_07_13 for pictures. 7/12/06 - Wednesday - Left Portland, drove to Clarkston, Washington to visit sister Cheryl. Click index_07_11_thru_07_13 for pictures. 7/11/06 - Tuesday - Left Corvallis, Visited Bruce in Salem, then on to Omar & Sarah Steinberg's home in Portland. Click index_07_11_thru_07_13 for pictures. 7/9/06 - Sunday - Woke up in Eureka, did a fantastic loop east on the motorcycle famous California Highway 36, then west back to the coast on California Highway 299. Man what a ride! Then up Highway 1 to Oregon, and cut in at Waldport, Oregon on Oregon Highway 34 (Alsea Highway). Stopped in Corvallis. Click index_07_08_thru_07_10 for pictures. 7/8/06 - Saturday - Packed and leaving San Francisco area. Heading north. Click index_07_08_thru_07_10 for pictures. The drive up along Highway 1 was spectacular, very little traffic, tons of sunshine. Stopped in Eureka. Canada Highway 97 from the US/Canada border up to Kelowna, Canada (from Osoyoos to Kelowna on Canada Highway 97) is very pretty, very scenic, along the side of massive British Columbia lakes and massive British Columbia mountains. This is a highway, most of it is 4 lane divided, and drives fast, only big graceful 60mph curves, nothing sharp. Drive it for the view. Canada Highway 6 from Kelowna (or Vernon just north of Kelowna) to Needles Ferry then to Nakusp, Canada is both gorgeous AND has spectacular motorcycle terrain and curves. Nothing slower than a 30 mph turn, but plenty of them, very little traffic, and did I mention the spectacular views? That road is a heck of a great twisty motorcycle drive. Canada Highway 23 from Nakusp up to Revelstoke, Canada is very pretty, and is always doing big sweeping turns so it isn't completely boring, but has very few sub-45mph turns. Well maintained. Canada Highway 5A south from Kamloops, Canada to Hope, Canada to (See "A" through "B" on map) from Kamloops, British Columbia, Canada through to Hope, British Columbia, Canada has these big sweeping turns and small rolling hills, a little through farms and some by small lakes (small by British Columbia standards). Click here for a picture along Highway 5A. You can basically set your cruise control on 75 mph and never take it off, none of the turns are sharp or that exciting. There are a couple of more fun sections right at the bottom of the curve before you get to Hope (see "B" on the map above). Canada Highway 12 through Lillooet, Canada to (See "B" through "C" through "D" on map). Fun little road, no emergency lane, road isn't as well maintained as the main highway which makes for uneven pavement enough to be entertaining (not dangerous or unpleasant). Click here for a picture of Lillooets and here for a photo of Canada Highway 12 along the motorcycle ride. Canada Highway 24 then Highway 1 from 100 Mile House to Jasper, Alberta, Canada to (See "D" through "E" through "F" on map). Mostly just fast highway, enough sweeping turns back and forth to keep it from being completely boring, but nothing to go seek after. Nice scenery although not "huge" mountains until the end. Click here for a Mt Robson photo along the way to Jasper. Lots and lots and LOTS of wildlife as you get closer to Jasper, Alberta, Canada. 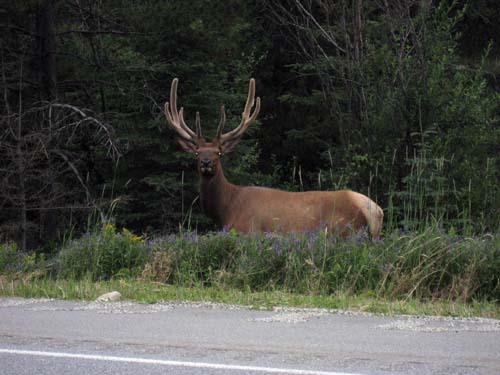 Click here for a photo of some elk on the road near Jasper.